Thirty-one-year-old George Griffiths died this date, March 24th, in 1841 and was buried at Bethel Burying Ground. Thirty-one-year-old George Griffiths died this date, March 24th, in 1841 of Small Pox and was buried at Bethel Burying Ground. The 1840 U.S. Census shows that he was married and that the couple had a daughter. The 1839 City Directory reports his occupation as a laborer. Ms. Griffiths worked as a “day worker.” Her first name was not recorded. The Griffiths’ family lived in Marriot’s Lane between 2nd and 3rd Streets in the Olde City section of Philadelphia. Above is a 1910 photograph of Montrose Street (formerly Marriot’s Lane). Mr. Griffiths was a victim of a small epidemic of Smallpox in 1841 Philadelphia. The Board of Health’s records show that he was one of the 159 victims who died that year. The worst plague of Small Pox took the lives of 4,464 Philadelphians between 1871-1872. The disease is an extremely contagious and deadly virus for which there is no known cure. The last known case occurred in the United States in 1949 and, due to worldwide vaccination programs, this disease has been completely eradicated. The first smallpox vaccine was created in 1758. The success of vaccination from the deadly effects of this disease was brought to America by an enslaved Black man named Onesimus. * It is not known if Mr. Griffiths was vaccinated. A small percentage of those vaccinated still died from the disease. **”North American,” 29 March 1841. 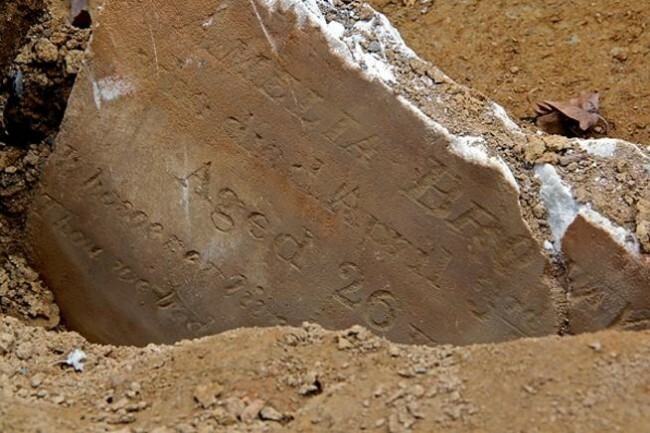 ← Fifty-year-old Sarah Larey died this date, March 19th, in 1840 and was buried at Bethel Burying Ground.